It was only a matter of time before the world's largest food & beverage company became the largest processor in the U.S. and Canada. Nestlé SA's various operations in our two countries have been growing sales aggressively the past decade through a mixture of organic growth and acquisitions. When we applied our unique analysis this summer to sales figures for this year's Top 100© list, we had a new leader. Nestlé's U.S. and Canadian operations together increased revenues by 14 percent in 2008 to $26.5 billion. Their parent, Nestlé SA of Vevey, Switzerland, had 2008 sales of $101 billion. While Nestlé's operations in North America include several separate companies, at the core of all this activity is the broadest-based operation, Nestlé USA, based in Glendale, Calif. 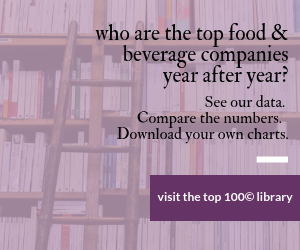 The $10 billion company encompasses beverages (both milk-based and coffees and teas), confections (Butterfinger, Nestlé Crunch, Wonka products), ice cream (Dreyer's/Edy's and Haagen-Dazs) and frozen food products (Buitoni, Lean Cuisine, Stouffer's). Our Processor of the Year is an award for more than just size or financial performance. Nestlé USA is a leader in new product development, having debuted 70 new items this year. Not just a marketing organization, the company has 26 manufacturing facilities in the U.S. and manufactures the majority of its products. Nestlé puts a heavy emphasis on volunteerism and is a major supporter of Feeding America (formerly America's Second Harvest), the country's largest hunger relief charity. For these reasons and many more, Nestlé USA is our Processor of the Year. At Nestlé USA, a number of products enjoyed great years. "In 2008, our baking business grew 11 percent in sales and increased its market share," according to Brad Alford, chairman and CEO of Nestlé USA since 2006. "This growth was due to new product introductions, including Nestlé Toll House refrigerated cookie dough tubs, and increased distribution. Also, the Hot Pockets and Lean Pockets brands increased sales by 8.7 percent because of new product introductions and reformulations throughout the product lines. "Our Ready-to-Drink chilled business also had good growth thanks to our new state-of-the-art aseptic factory in Anderson, Ind.," he adds. Two themes seem to permeate this organization. First is the stated goal from the Swiss parent, that Nestlé SA is transforming itself into a "nutrition, health and wellness" company. That's a tall order when two of your most famous products worldwide are candy bars and ice cream. But Nestlé USA and other units explain it as "the key to a well-lived life is a combination of physical activity and a balanced diet"; "making smart decisions, both big and small"; and "providing convenient, nutritious and delicious foods." "We focus on three nutrition messages," explains Chavanne Hanson, Nestlé USA's "wellness champion," and one of 85 Nestlé SA wellness champions around the globe. "No. 1 is positive nutrition – but with taste and pleasure at the core. No. 2 is moderation and variety – to achieve a balanced and healthy diet. No. 3 is authenticity and transparency – clearly sharing the nutritional value and nutrition content including fat, calories and sodium of all our products. "With this in mind, all foods can play a role in the context of a healthy diet," she says. Moreover, it means tweaking recipes in every product line for optimal wellness benefits without sacrificing taste; providing healthier options of nearly every product for those who need them (and not forcing them on those who don't); and reminding consumers that self-control plays a big role in health — that with a sensible choice for lunch, a mid-afternoon candy bar is OK; that with a healthy dinner, a little ice cream is an acceptable nightcap. Asked what would be the most important point to get across, Alford says: "That all of us at Nestlé USA are passionate about giving consumers great-tasting and nutritious foods and beverages they can feel good about serving to their families. We know that maintaining a healthy lifestyle requires making smart decisions, which is why we make it a priority to provide consumers with better-for-you options as well as nutritional information." The other theme is "Creating Shared Value." It was developed at Swiss headquarters and posits that a company cannot deliver long-term value for its shareholders without contributing to society. "It is not philanthropy or an add-on, but a fundamental part of our business strategy," says the corporate report on the subject. "We need to create value for the people in the countries where we are present. This includes the farmers, who supply us, our employees, our consumers and the communities where we operate." And later: "We need to demonstrate responsible behavior – by assuring compliance and sustainability." At Nestlé, Creating Shared Value focuses on nutrition, the responsible management of water resources and improving the lives of farmers and rural communities around the world. Here in the U.S., Nestlé USA is focusing its efforts on the areas where it can make the greatest positive impact – on issues relating to nutrition, health and wellness as well as sustainability. Creating Shared Value is "the convergence of competitiveness and sustainability," Jose Lopez, executive vice president for operations and global business excellence, wrote in a position paper. He says the foundation is the 1987 statement of the United Nations' Brundtland Commission: "Development which meets the needs of the present without compromising the ability of future generations to meet their own needs." Nestlé SA is no newcomer to the U.S., having established its first facility in Fulton, N.Y., in 1900 to produce condensed milk and infant formula. A year earlier, Carnation Co. began operations in Kent, Wash., with a new process to produce canned, sterilized, evaporated milk. For much of its first 70 years, Nestlé in the U.S. was primarily a candy, coffee and tea company. A transforming acquisition came in 1973 with the purchase of Cleveland's Stouffer Corp., a classic story of a family restaurant chain that starting offering frozen versions of its popular entrees so patrons could cook them at home. Nestlé bought in at a critical time, when the Solon, Ohio, plant required upgrading and R&D needed funds for some ambitious new products – including a novel line of reduced-calorie entrees that would be called Lean Cuisine. During the same time period, Carnation enjoyed steady growth and diversity. No longer just a condensed milk company, Carnation was busy creating new grocery categories with products such as Coffee-Mate and Carnation Instant Breakfast. The company had grown to $3.5 billion in sales with products ranging from evaporated milk and ice cream to Buitoni pastas and sauces, Friskies pet foods and Libby's pumpkin products. So another transformative acquisition for Nestlé arrived in 1985 with the purchase of Carnation Co.
1875 Daniel Peter, a friend and neighbor of Henri Nestlé, figured out how to combine milk and cocoa powder to create milk chocolate. He used Nestlé's condensed milk. His company would be acquired by Nestlé. "I joined Carnation right out of business school in 1980 with the goal of becoming a general manager for a packaged goods company," recalls Alford. "I like the nuts and bolts of running a company. I like all parts of the business, whether it's sales, advertising, talking about a new product, going to manufacturing facilities. I even like to see the trucks leaving the distribution center." There has been buying and selling since, with Contadina, Ortega Mexican foods and secondary coffee brands (Hills Brothers, Chase & Sanborn, MJB) being jettisoned and Baby Ruth and Butterfinger (from Planters-Lifesavers), Drumstick novelties, Alpo dog foods and Haagen-Dazs being folded in. In the new millennium, key buys have been Power Bar, Dreyer's Grand Ice Cream and Chef America, creator of the Hot Pockets handheld foods. Nestlé USA was incorporated in 1990 to handle all this activity. Other key acquisitions for the Swiss parent – such as Ralston Purina, Gerber baby foods and numerous bottled water brands – have spawned business units separate from Nestlé USA. Keeping all those new product pipelines full is a global R&D organization and the considerable resources of a $101 billion global food & beverage company. Making all those products is a manufacturing organization that is well funded but disciplined by the financial and corporate goals of its Swiss parent. For both of those perspectives, see the following stories. While Joe Weller, chairman and CEO of Nestlé USA for 11 years, is remembered for the acquisitions, Alford may be credited with aligning this sprawling organization around the consumer, developing personnel and best practices and keeping it all in step with Vevey's principles. "Joe Weller was a great mentor and role model for me. In 2006, I was extremely fortunate to inherit from him a very strong company with a tremendous product portfolio and outstanding performance. What new CEO wouldn't want that?" Alford says. "I'm building on that foundation and making Nestlé USA stronger by focusing on understanding our consumers. To do this we must have insight into what our consumers want – emotionally as well as nutritionally – and then meet those needs better than anyone else. Because at the end of the day, consumers want products that taste great and make them feel good about their choice." Starting in late 2006, scientists and others started worrying about the disappearance of honeybee colonies in North America. While such disappearances have occurred throughout history, the rate of disappearance was alarming. Scientists began studying the phenomenon in earnest and applied the term Colony Collapse Disorder (CCD). CCD symptoms have been reported by more than 35 states across the U.S. and in many other countries. Researchers do not know the cause. But in tandem was a heightened awareness of how many agricultural crops worldwide are pollinated by bees. "One-third of all the foods we eat are pollinated by honeybees," says Diane McIntyre, senior pubic relations manager for Häagen-Dazs. "But over the past three years, more than one in three honeybee colonies has died nationwide, posing a serious risk to our natural food supply." So, Nestlé's Häagen-Dazs brand took up the cause. "We had never adopted a cause before, but this one seemed so right," McIntyre says. "With 50 percent of the Häagen-Dazs brand's all-natural ice cream flavors dependent on ingredients pollinated by honeybees, the solution to their disappearance was critical for the brand." In 2008, the Häagen-Dazs brand began funding sustainable pollination and CCD research at University of California at Davis and at Pennsylvania State University. The company also resurrected an old Häagen-Dazs flavor—dating all the way back to founder Reuben Mattus' days—called honey vanilla, now renamed Vanilla Honey Bee. The brand pledged $250,000 again this year, bringing its total donation for honeybee research to a half a million dollars over two years. Neither the cure nor the cause of CCD has been discovered, but current thinking focuses on mites, poor nutrition, insect diseases and neonicotinoids in pesticides. Research continues. One advantage of being part of a large and global company is the opportunity for employees to work in other countries. "I had the opportunity to work in Australia two different times and the international experience made me a much better person and a much better executive," Alford continues. "No matter what country you work in, there is always a diverse mix of employees from around the world. It's a necessity if you want to make it to the most senior ranks of leadership at Nestlé. "A great example is our worldwide CEO Paul Bulcke. Paul joined Nestlé over 30 years ago in his native Belgium as a financial analyst. He moved over to marketing and worked in Switzerland, Spain, Ecuador and Chile. Then he held market head jobs in Portugal, Czech Republic, and Germany. He was heading up the entire North and South America Zone when he was named worldwide CEO early last year." Despite all its advantages, size does have its shortcomings. As the world's largest food company, Nestlé SA tends a balancing act between fostering independent and localized thinking and enforcing corporate goals, between requiring financial discipline and sharing its considerable financial resources. It's precisely that kind of stewardship that enables the budgeting of $500 million to build the world's largest and most sophisticated milk-based beverage plant (in Anderson, Ind. ), which will create shelf-stable milk products that can be shipped at ambient temperatures and with a six-month best buy date. …And yet promotes Libby's canned pumpkin every fall. That comes up with the formulation and process changes that invented the concept of slow-churned ice cream, which lowered calories and fat but maintained the taste of full-fat ice cream. … And still makes Pixy Stix and Lik-M-Aid. That can dictate to its plants the conversion to harmless non-fluorocarbon refrigerants – including much original development work on carbon dioxide and ammonia hybrid systems – to prevent ozone depletion. …And still makes condensed milk. But all the size, global reach and financial discipline is secondary to the food and the consumers who buy it. "Ultimately, all of us at Nestlé are passionate about food," says Alford. "I always say that we have to understand our consumers better than anyone else to remain successful. We use a variety of means to dig as deep as possible so we can truly identify with our consumers' wants and needs. "One of our most recent initiatives has to do with identifying how consumers behave in-store – where they are known as shoppers. Marketing to a consumer is different than marketing to a shopper, because what a consumers says they will buy and what they actually buy are not necessarily the same thing. We know from research that up to 70 percent of purchase decisions are made in-store – so we are working with our retail partners to give shoppers what they want in each retail outlet, whether it's meal solutions, recipes or different types of information about our products. "At our most recent marketing summit, we focused on shopper marketing and took part in a valuable exercise that allowed us to walk in our shoppers' shoes. We all went to different food stores with a shopping list and a fixed budget of $60 for a week's worth of groceries. That's the challenge most of our consumers face every week and it was a great learning experience. My goal is to get the shopper marketing mindset to become more integrated into our planning process and our overall business approach." Twenty years after I first visited, this is a very different company.